Dog agility is a canine competition that tests the maneuverability of the dog through an obstacle course in race. A handler directs the dog as it finishes the obstacle course. A judge records the canine's performance, specifically the time and accuracy of the run. The dog must successfully complete the obstacle course without a leash. The handler cannot entice the dog to complete the race using food or toys as incentives. In fact, the handler cannot touch the dog during the entire competition. 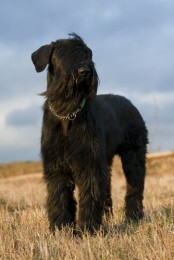 The handler may only use vocal commands, and hand or body signals to direct the dog, which requires exceptional training and coordination between the animal and handler. A dog agility obstacle course consists of a limited number of obstacles predetermined by a judge before the event. The judge dictates the design of his or her own choosing in a specified area. The surface area of the obstacle course may be made of grass, dirt, matting, or rubber. The obstacles may need to be completed in a specific order, a requirement that tests the handler's coordination skills with their dog. The handler must assess the course, administrate handling strategies, and direct the dog through the obstacle course in a timely and accurate manner. Columbia Agility: What is Dog Agility? : Dog agility competitions test a canine's maneuverability through course obstacles. Dog Agility: A set of pictures from a live dog agility event. What is Agility? : The Skyline Agility Club defines the sport that tests a dog agility among other participants within its own division. What is Dog Agility? 101: Agility Addict attracts dog agility enthusiasts to learn more about ever-growing sport. Agility 101 or What Do All Those Letters Mean? : A beginner's guide to dog agility that describes four different competition classes, including standard, jumpers with weaves, preferred standard, and preferred jumpers with weaves. Why not try Agility! (PDF): Dog agility competitions provide a means for energetic, playful dogs to exert their energy outside of their kennel. 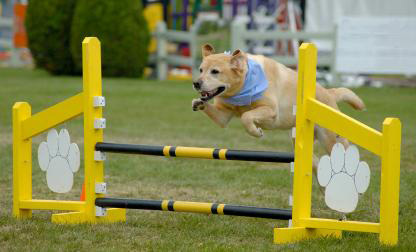 204 Agility Obstacles: A canine agility run consists of predetermined number of obstacles, including bar jumps, double jumps, panel jumps, triple jumps, tire jumps, a-frames, dog walks, tables, chutes, weaves, hoops, and more. 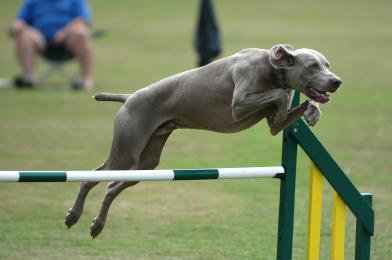 Quicksilver's Basics of Agility: An all-inclusive webpage that describes the basics of dog agility, including the obstacle courses, the breeds involved, ages, training, and health considerations for every dog owner. Regulations for Agility Trials (PDF): A comprehensive resource that provides the general guidelines and regulations for dog agility trials. The Spectators Guide to Dog Agility (PDF): A layman's guide to dog agility that provides some key point of reference for those unfamiliar to the sport, including its definition, the obstacles that one typically sees on the course, what happens at the event, competition levels, and the types of competition classes involved in the sport. Introduction to Dog Agility: An extensive document that explains the basics of dog agility. Agility Dog Show Rule Book (PDF): A rule book that explains the purpose of dog agility, its general rules, steps toward advancement, agility classes, performance regulations, specifications for the construction of agility obstacles, and how to train a dog to perform these obstacles. Exhibitor’s Handbook For Guidelines Governing North American Dog Agility Council Sanctioned Trials: Levels, Divisions, Classes, and Categories: A comprehensive handbook for exhibitors who wish to know the official guidelines for dividing dog agility competitors into specific classes and categories. A Guide to NADAC Agility Trials (PDF): A comprehensive document that answers frequently asked questions (FAQs) about NADAC agility trials for prospective competitors of the organization’s sponsored events. Weaves Without Worry (PDF): An advanced guide that teaches dog owners how to train their dog to perform a solid weave in the sport known as dog agility. Agility Tips from Experienced Competitors: A basic compilation of advanced tips from experienced dog agility competitors, such as never losing sight of a dog, getting a dog's attention, driving a dog toward a last jump, forgetting the commands and concentrating on the competition at hand. Feeding Dogs for Agility (PDF): An extensive nutritional guide for dog agility competitors. So You Want to Train Your Dog for Agility? (PDF): An article that provides tips and pointers for dog owners who wish to train and enroll their pet into agility competitions. Dog Agility Training Guidelines for Competition (PDF): A set of training guidelines for dog owner's interested in having their dogs compete in agility contests. A Guide to Your First Agility Class (PDF): A general guideline that teaches dog owners what to expect before bringing in their pet for agility training. Up Contact Training (PDF): An outline of up contact training guide for dog owners who wish to personally train their canines for agility competitions. Canine Performance Events, Inc.: A membership-based organization that arranges dog agility competitions around the United States. United States Dog Agility Association, Inc. (USDAA): An authoritative dog agility association that promotes the education, training, promotion, and organization of competitive events. Dogs on Course: An organization that recognizes canine competitions through a series of dog agility venues and other related sports. Teacup Dogs Agility Association: A dog agility association that provides a competitive venue for dogs of small stature or of a particular breed. UK Agility International (UKI): An international organization dedicated to providing pertinent information about the sport of dog agility to its expanding group of enthusiasts. United Kennel Club: The world's largest all-breed dog registry that provides a variety of information, including dog agility events. Minnesota Agility Club: A non-profit dog agility club specific to dog owners living Minnesota. The Travis Agility Group: A non-profit organization that was formed to promote the sport of dog agility in the greater Austin and Central Texas region.